featuring the "Baby Cakes Tie Dye Dress"
I LOVE THESE SANDALS. They're still available at Target so GO GET THEM! I love how incredibly comfy and stylish they are, and honestly look absolutely amazing with just about any outfit. You can dress them up or wear them casual. How freaking cool are these colors? 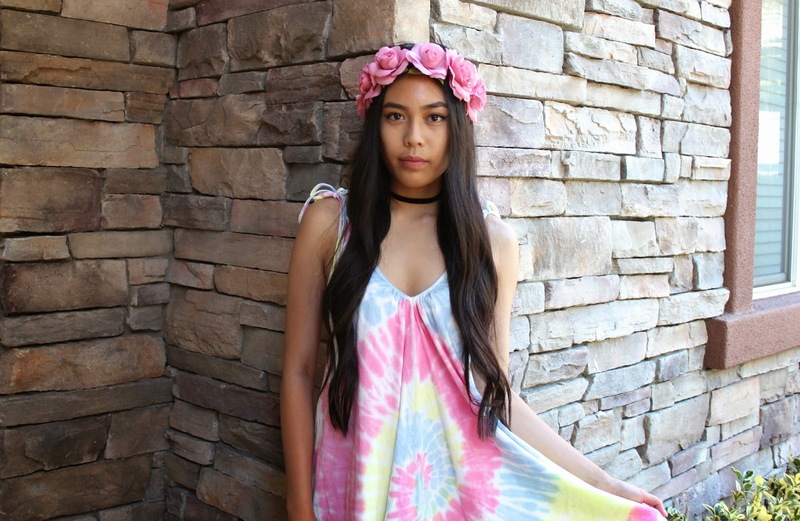 If you haven't noticed from my past outfits, I've currently been loving tie-dye. And these colors are perfect for spring (and summer)! It's such a comfy dress and really great quality. The ideal dress to just lounge around in during a warm day. I had to pair it with this floral crown because the colors fit so well with each other. And of course, a classic black choker to finish the outfit. Want to purchase this dress? Click here! *My reaction when I see all of Shop Tobi's new arrivals! * Check out their site, click here! These sunglasses are only available in stores at Kaitlyn Clothing! I know I've gotten a few questions that they can't find them online, but unfortunately they're only found in stores. BUT you can find the same sunglasses at Sunglass Spot!